Raw data from survey responses can be exported as csv, native SPSS, and csv compatible SPSS (some plan limits apply). This user guide demonstrates the steps taken to export survey response data from your Checkbox account. 1. From the survey dashboard or survey editor, click the Analyze -> Responses -> Export Responses. NOTE: You can also choose Quick Export, which will bypass all the following steps by using your default export settings found under System Settings -> Report Settings -> Response Export. You can use this one-click export method if you don’t need to change any of the options that are described in the following steps. 2. Choose your export options. Start and End Date: Filter response data by response date or time frame. 3. Choose the information you want to include in your export. The options shown below apply to the csv output format. SPSS has fewer options. Detailed Response Info: Enable this option to export information about the survey response, including the response ID, response GUID, start and end date/time, total time, last edit date/time, IP address, language, username, invitee. Detailed User Info: Enable this option to export user profile properties such as email address, first name, last name, etc. NOTE: this option is only applicable for known, registered users of Checkbox. Merge Checkbox Results: If your survey contains checkbox question items, enable this setting to display the answer options in a single cell, separated by commas. If you leave this unchecked, checkbox items will be displayed as one answer per column in your export file. Export Open-Ended Results: If your survey contains any Open Ended Text items, enable this option to include these. Export With Aliases: If you created any question or answer aliases in this survey, enable this option to display the alias text in place of the original survey text. Export Hidden Items: If you created Hidden items for this survey, enable this option to export them. Export Incomplete Responses: Enable this option to include the data from unfinished survey responses in your export. 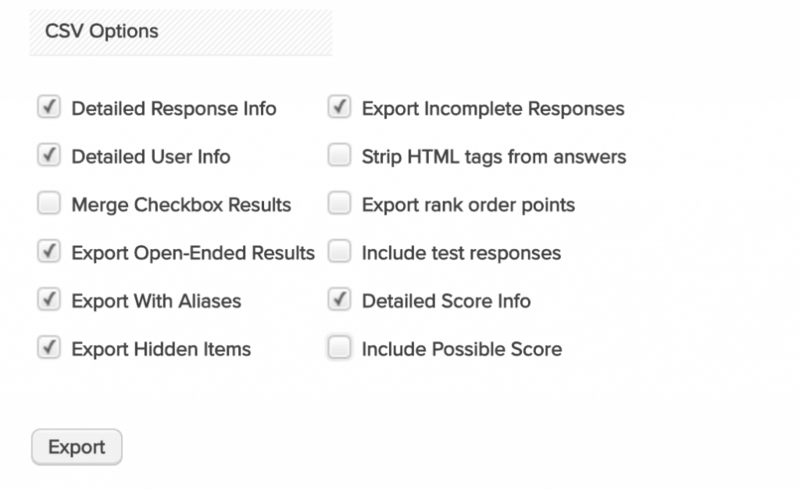 Strip HTML tags from answers: If your survey allows respondents to format the text of open responses, enable this option to remove formatting in your export for a cleaner look. Export rank order points: If your survey has rank order items this option will invert the results, showing the score of the answer rather than the rank position. Include test responses: If your survey has test responses you can choose to export these. 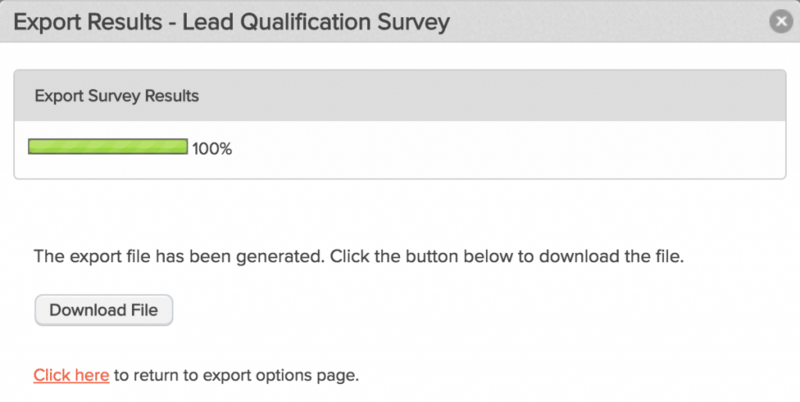 If your survey contains a File Upload item, you can select Download Files to export a zip file of all uploaded files. 6. Select Export to create the file then Download to download it to your computer. 7. Once the file is downloaded, you can open it in the software application of your choosing.